The Great Inns of Britain Gift Vouchers are the perfect solution when you want to give someone special an equally special treat. Available for any amount upwards of £50, the vouchers are valid for 24 months. Vouchers are valid for use against a stay at any of the Inns that are current members of Great Inns of Britain at the time of making a booking. Don’t fret if you’ve left your shopping until the last minute as you can now purchase a Gift Voucher online and print it off at home in seconds! 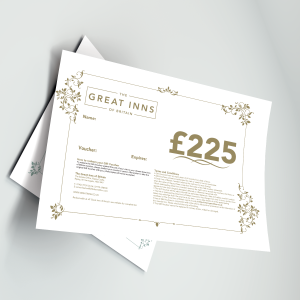 We email your voucher as soon as you place your order, so all you need to do is print it out and present it to the lucky recipient. Alternatively, you can purchase physical vouchers by clicking here.